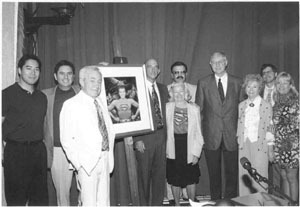 Left to right, Robert Rockwell, Michael Walbrecht, Jim Nolt (publisher of The Adventures Continue magazine and website), Bettie Shayne, Armand Vaquer, Jeff Corey, Jack Larson, Sup. 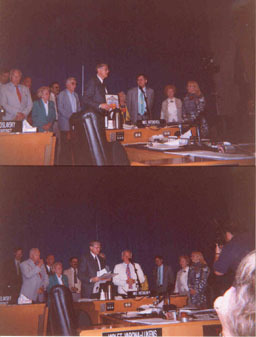 Antonovich, Noel Neill, Paul Levitz, Joanne Siegel and Laura Siegel Larson. 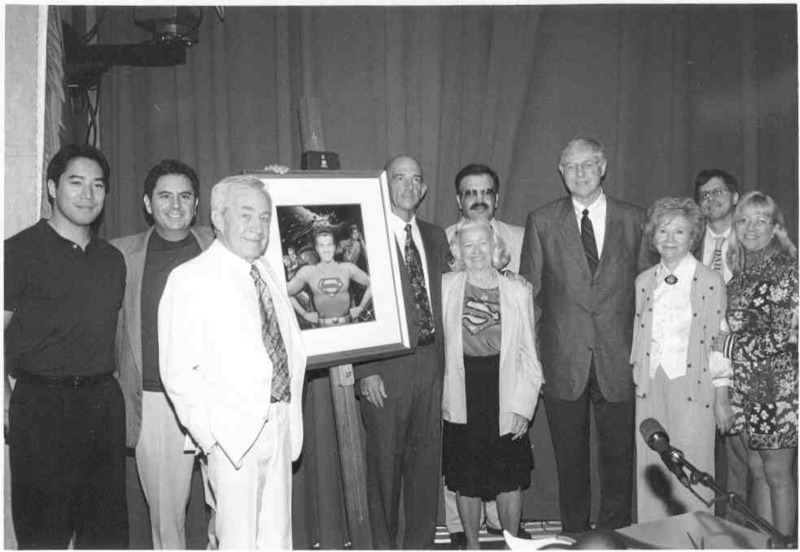 The Adventures of Superman television show was honored on its 50th Anniversary by the Los Angeles County Board of Supervisors in a ceremony July 10 in Los Angeles. Attending the ceremony were Jack Larson, Noel Neill, Robert Rockwell, Jeff Corey, Mrs. Joanne (Jerry) Siegel, Mrs. Bettie (Robert) Shayne, DC Comics V.P. & Publisher Paul Levitz, Warner Bros. V.P. Michael Walbrecht. A luncheon at Cafe Pinot in downtown Los Angeles followed the ceremony. 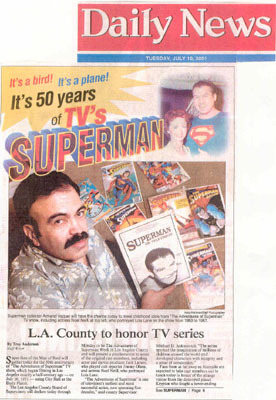 50 YEARS of TV's SUPERMAN! Super-fans of the Man of Steel will gather today for the 50th anniversary of The `Adventures of Superman' TV show, which began filming in Los Angeles exactly a half-century ago -- on July 10, 1951 -- using City Hall as the Daily Planet. 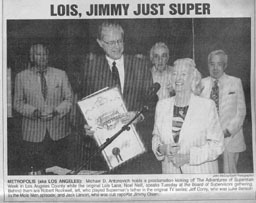 The Los Angeles County Board of Supervisors will declare today through Monday to be The Adventures of Superman Week in Los Angeles County and will present a proclamation to some of the original cast members, including actor and movie producer Jack Larson, who played cub reporter Jimmy Olsen, and actress Noel Neill, who portrayed Lois Lane. 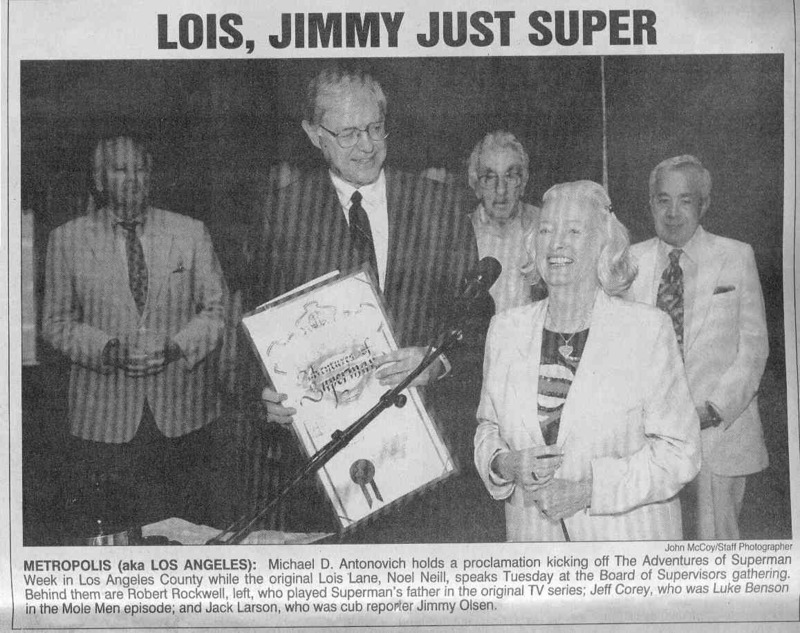 "The `Adventures of Superman' is one of television's earliest and most successful series, now spanning five decades," said county Supervisor Michael D. Antonovich. "The series sparked the imagination of millions of children around the world and developed characters with integrity and a sense of compassion." Fans from as far away as Australia are expected to take cast members out to lunch today in honor of the strange visitor from the destroyed planet Krypton who fought a never-ending battle for `Truth, Justice and the American Way!'" "I've been a fan since I was a kid," said Tarzana resident Armand Vaquer, 47, who helped organize the event. "I got into the show in 1962. It's never left the airwaves. 'I Love Lucy' and 'The Adventures of Superman' are the only two shows I can think of that have had that kind of endurance and popularity." The reunion today will give Vaquer and other fans a chance to meet their idols for the first time and find out what it is about the Superman myth that is more powerful than a locomotive. "I think it's the dual identity," said Jim Nolt of Lititz, Pa., who operates The Adventures Continue Web site and publishes a magazine of the same name. "I think the appeal is that all of us in some way would like to be two different people. We have the person we are and the person we'd like to be. And Superman, of course, could be those two people. He was Superman. But he was also an ordinary person as Clark Kent." Brentwood resident Larson, 68, described by People magazine as the "first teen idol in 1953," said he was a struggling actor until he took the part of Jimmy Olsen and became famous. "That's the first time I worked with George Reeves," Larson said. "He saved Jimmy from villains who locked him in a safe and were lowering him out the building. When Clark Kent saw this, he ran into an alley, turned into Superman and saved Jimmy from crashing to the ground. "It was the first time I said, 'Golly, Superman! I never thought you would get here in time.' I said it about 100 more times. He was always being saved by Superman, episode after episode." Neill said the appeal of Superman was the goodness. "Nobody is really killed," she said. "There is no blood. When I was doing college tours, the little gals said they were encouraged by Lois Lane to get out into the man's world. It's kind of nice to know we did something good." The mythic American superhero first appeared in DC Comics in June 1938, created by two 19-year-old boys from Cleveland, Jerry Siegel and Joe Shuster. An instant success, the character revolutionized the fledgling comic book industry and sales of the comics quickly reached close to a half-million copies a month. Superman then moved on to radio and the movies in the 1940s with two hit 15-chapter serials. Starring actor George Reeves as Superman and his alter ego, Daily Planet reporter Clark Kent, "The Adventures of Superman" was a natural for the new medium of television, first filmed on July 10, 1951. The popularity and longevity of the TV show and the continuing success of the comic book made Superman into one of the longest-reigning adventure heroes in popular history. Superman appeared in a new series of films in the late 1970s and early 1980s, starring Christopher Reeve and Margot Kidder, and led to yet another popular television series in the mid-1990s, "The Adventures of Lois & Clark," which starred Dean Cain as Superman and Teri Hatcher as Lois Lane. But, none would surpass the popularity and longevity of the original 1950s TV series. Reeves became a hero to millions of baby boomers as TV's first Superman. But by the time the show was canceled in 1957, Reeves had been type-cast as a superhero and his film career had withered. Two years later, after two near brushes with death, the 45-year-old actor/director was found in the bedroom of his home in Benedict Canyon, dead from a gunshot wound to his head. His fiancee, Lenore Lemmon, was downstairs with some guests. Two additional bullet holes in the bedroom have long fueled suspicion of foul play, although police investigators and the coroner ruled it a suicide. "It's hard to say what really happened," Vaquer said. "He might have been depressed over a lack of work. But then again there are other reports that he had different offers coming in. He was about to be married three days later." Vaquer said Reeves' personality and values are why the television show has withstood the test of time. "He had a commanding presence," he said. "He was trained as a leading-man matinee idol. He had a father-figure way about him which made kids in those days look up to him." Nolt agreed it's the values Reeves stood for. "George was very serious about the role," Nolt said. "Even though it was a kid's role, even though he thought he had no adult fans, he gave of himself 100 percent. Fighting for truth and honesty appeals to me." Larson said it makes him sad that Reeves won't be at the reunion today. "He always said he wished he had one grown-up fan instead of all these kids, and now he does. But he's not here to appreciate it. But I am. I will always wave the flag for George. He was a great guy and a wonderful Superman."